Iconic cars are synonymous with Hollywood. Think of the Batmobile, the DeLorean from the Back to the Future movies, or anything James Bond drives. Not all legends, however, come from the big screen. Dr. J. Robert Beyster was a visionary scientist and businessman who founded the company that eventually became Leidos in La Jolla, Calif. in 1969. He also had a pretty cool ride back then: A Chevy Chevelle Malibu. 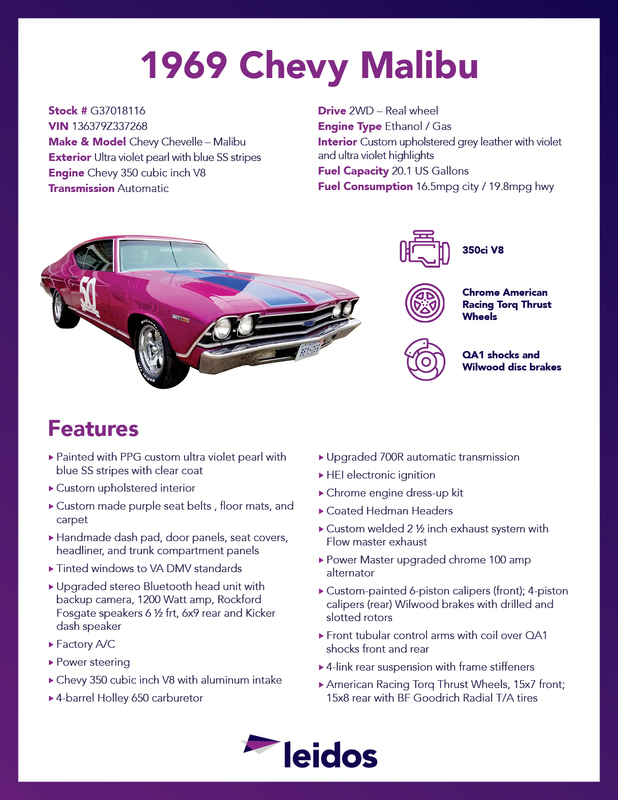 To honor Dr. Beyster, Leidos will showcase a refurbished and rebranded 1969 Malibu – complete with “BEYSTER” license plates – nationwide as part of its ongoing 50th anniversary celebration over the next year. The search took about a month until the perfect car was found. After finalizing the sale, the Leidos team shipped the car from its location in Chula Vista, Calif. to Southern Classics, a car restoration shop in Fredericksburg, Va.
Southern Classics worked on the car for almost three months, modifying it for its grand unveiling in Feb. 2019. While Dr. Beyster’s original Malibu was blue with a black top, the 50th model is unmistakably Leidos with an ultra-violet exterior and a fully-restored custom leatherette interior that’s violet, ultra-violet, and gray. The exterior also includes blue “SS” stripes on the hood and trunk in a nod to the company’s SAIC and Lockheed Martin heritage. The restored Malibu is what’s called a “sleeper” as it has a 350-cubic inch, V8 engine (it originally had 307ci V8). Leidos is also producing a 1:64 scale replica version of the Malibu that will be distributed to employees and made available to others for a limited time.